In our brave new future, DNA engineering has resulted in a terrible genetic flaw. Women die at the age of 20, men at 25. Young girls are being abducted and forces to breed in a desperate attempt to keep humanity ahead of the disease that threatens to eradicate it. 16-year-old Rhine Ellery is kidnapped and sold as a bride to Linden, a rich young man with a dying wide. Even though he is kind to her, Rhine is desperate to escape her gilded cade - and Linden's cruel father. With the help of Gabriel, a servant he is growing dangerously attracted to, Rhine attempts to break free in what little time she has left. 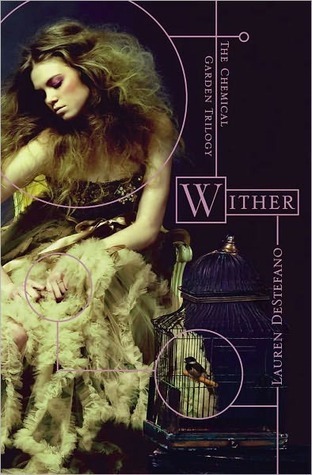 Wither is a beautifully written novel. The emotions conveyed and the world created by DeStefano are all so vivid. The story is heart-wrenching and tear-jerking, the characters leave you with an aching heart, and the dystopian world is so tragically disturbing. I cannot conjure up the right words to appropriately express how talented Lauren DeStefano is. The way that she writes and her ability to simultaneously infuse beauty and horror is just indescribable. The pace of the story was quite slow and calm. This gave way to the character development and world building which was magnificently done. The plot focuses on Rhine's journey to build trust with Linden and his father, as she attempts to undermine them and ultimately escape from the life she has been thrust into. There are plenty of emotional moments, as Rhine develops strong relationships with her sister brides as well as Linden's dying wife. Rhine is an admirable character. Her strength and dedication does not falter one bit, from the moment she is kidnapped. She wants out and that is the only option she will accept. She was so incredibly brave and strong. I will admit, that I didn't like Cecily toward the beginning of the book. She began to grow on me as the story went on but she let of a childish and immature vibe that really frustrated me. On the other hand, I loved Jen the whole way through. Her reaction to her situation was not what I expected from her, but I still liked her personality. She brought out a lot of emotion in me when it came down to some intense scenes. This is really hard to write. I just can't put into words how beautiful the story was. The story itself was quite horrifying, but DeStefano's writing was gorgeous and perfect for this type of dystopian book. She managed to combine these two elements so well. This is currently in the post on it's way from amazon. I cannot wait to read it. Wither just sounds amazing. Also on it's way is divergent. I'm so thankful for the book community for introducing me to all these amazing books. I agree, this book was horrifying and amazing. Lauren DeStefano manages to mix together so well! Welcome to the blog of Little Book Owl. I’m Caz, an avid reader working in the publishing industry. Share book reviews and ratings with Catriona (LittleBookOwl), and even join a book club on Goodreads. The Fault in Our Stars GIVEAWAY! © ❝ LITTLE BOOK OWL ❞. Blog design by FCD. Banner image by Hardback Hoarder.